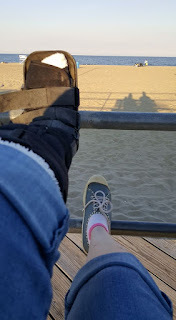 Living on the Smile Side of Life: Foot Follies – Week 8 Can a broken foot affect the brain? Foot Follies – Week 8 Can a broken foot affect the brain? Can a broken foot affect the brain? Recent studies have looked at why people are so resistant when their political views are challenged, the effects of diabetes and weight on brain function, and one that states that a sleep-deprived brain will actually eat itself. There are so many brain studies that Forbes Magazine actually selects at top 10 each year. And there are some pretty interesting ones covered over the years. So, it is not so far-fetched that this eight week broken bone journey may include some effects on my brain. Effects that have led me to do things, like, say, forgetting to put the filter basket back into the Mr. Coffee and plopping the paper filter and coffee grounds into the empty compartment, starting the coffee maker, leaving the kitchen, and coming back to find a flood of French vanilla coffee spilling into cabinet drawers and onto the floor. Little things like that, not anything that might start pointing to any kind of other brain problem, just stuff caused by a broken bone. There is the rare possibility of a fat embolism from a broken bone, but that is going to happen right away. According to the Mayo Clinic, a fat embolism in the brain can cause symptoms that range from “drowsiness, to seizures, to coma.” It doesn’t say anything about “stupid mistakes.” (Although, that “drowsiness” part is pretty tempting.) But at eight weeks out, I have to cross fat embolism off the list. There is a study that says a broken heart can actually hurt like a broken bone, but that doesn’t apply. There is a song called “Brain Dead” by a group called Broken Bones, but the sad and scary lyrics about a person on life support thankfully don’t apply here either. There is a great article in Science News from June 2017 indicating that there is really a bone/brain communication connection. Previously thought of as “dead” matter, bones turn out to be dynamic machines, pumping out new cells, and releasing hormones that communicate with the brain about quite a few things. Included are, appetite, energy level, blood sugar, and — wait — “memory and mood.” BINGO! Science fan that I am, this news is enough for me to extrapolate a theory that bones that release important hormones to the brain could actually suffer an interruption in that process if a bone is broken. And I can further theorize that possibly, the Fifth Metatarsal is the bone that controls most of the “memory and mood” hormones. Combine that broken bone with my recent recurrence of thyroid hormone troubles (the thyroid being the body’s hormone thermostat) and I conclude that I just might be suffering broken bone induced memory loss. If this is not an official diagnosis yet, medical researchers can feel free to quote me. Braman's Syndrome is not yet taken by any other condition as far as I know. I will happily volunteer for the "This is your brain. This is your brain on a broken foot" PSA. So, leaving the lovely card for yesterday’s bride and groom in the car at home wasn’t really my fault. The French vanilla coffee flood this morning was actually a medical issue, as well as the keys left in the door, the cell phone that is never where I left it and all the other assorted brain freezes of the past eight weeks. It is all the fault of my broken foot! The broken foot that I took to the doctor at 10 AM this morning for x-rays. Unfortunately, my appointment was for 3 PM. and PS: kudos to all who discovered that the Broken Bone Effect affected my grammar.